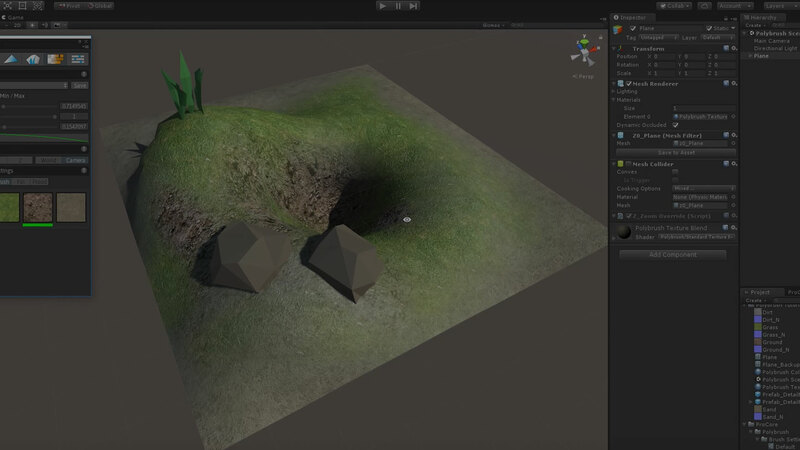 Blend textures and colors, sculpt meshes, and scatter objects in the Unity Editor. 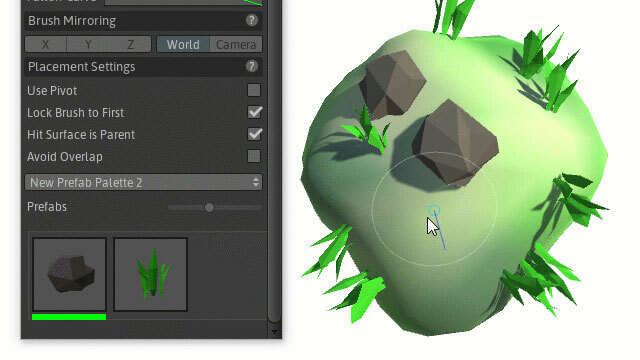 Polybrush enables you to blend textures and colors, sculpt meshes, and scatter objects directly in the Unity Editor. Combined with ProBuilder, Polybrush gives you a complete in-editor level design solution. You can also take advantage of Unity’s seamless round-tripping with digital content-creation tools (like Maya) so you can further polish models with your favorite tools. You can sculpt complex shapes directly in the Editor and use the Push/Pull tool to move vertices in positive and negative directions along an axis. Simply select any mesh object, then click and drag while hovering over the selected mesh. The actual movement of vertices is affected based on your Brush Settings. Texture Painting mode is for texture blending shaders. Polybrush includes a few different blend materials to get you started: Standard Texture Blend, TriPlanar Texture Blend, and Unlit Texture Blend. You can also write your own texture blending shaders. 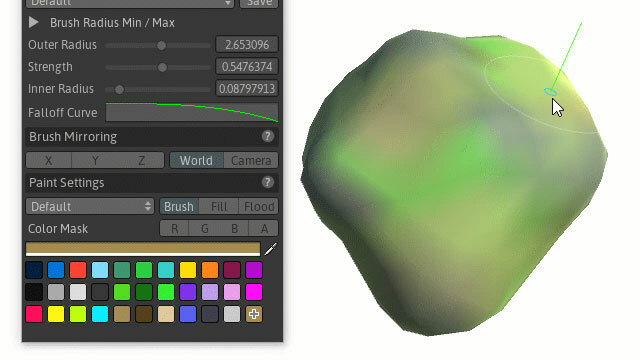 Color Paint mode enables you to set the vertex colors of a mesh with a brush or paint bucket. Use the toolbar under Paint Settings to choose between the two modes. Note that Vertex Color mode will only work if the shader material supports vertex colors. 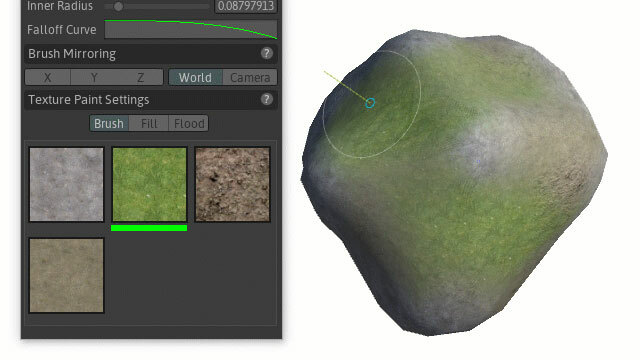 Polybrush includes some default materials that support vertex colors. Use one of these materials if you want to paint colors on a mesh. 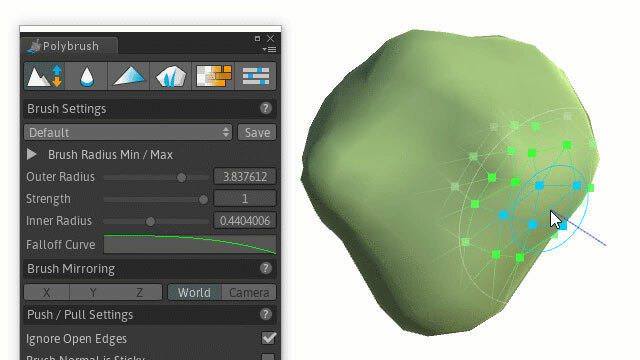 The latest version of Polybrush allows you to scatter objects in the world with highly customizable brushes. Polybrush is in beta and distributed via the Asset Store. Refer to the documentation and check out the tutorials. Be sure to check out ProBuilder.